and wished to see me. I took the letter to my Captain and he sent in for a furlough for me but it come back disaproved. now what I want is this. to go home with my old Regt. this fall. or a furlough for 30 days. my father is a por man with 8 children to support and I wish to be with the children when he leaves this world so that I can suport them. all other volunteers are going home and why not us that are in the vetran. Reserve. Corps. if the war was still in progress I would not say a word but as it is I can not help it. all of the soldiers that is in this Corps. 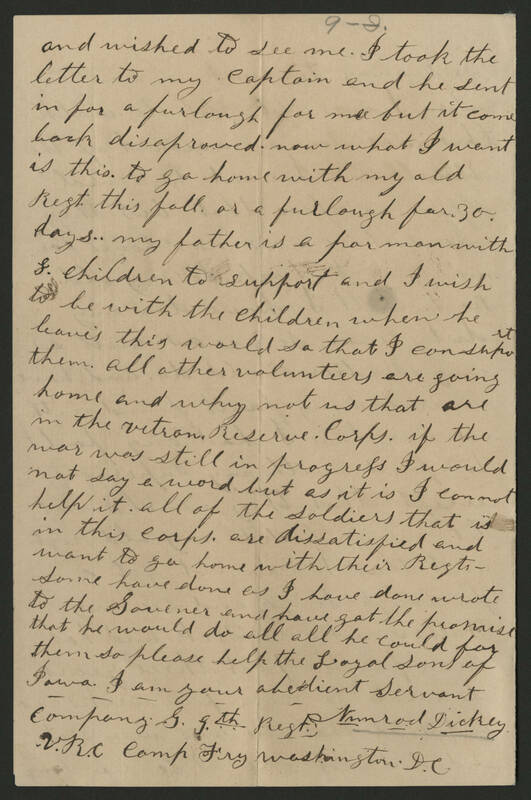 are dissatisfied and want to go home with their Regt.--Some have done as I have done wrote to the Govener and have got the promise that he would do all all he could for them so please help the Loyal sons of Iowa. I am your obedient servant Nimrod Dickey Company G 9th Regt. V.R.C. Camp Fry Washington D.C.